Home Football A Halloween Jagoff – Who Is Grendon Bailie ? A Halloween Jagoff – Who Is Grendon Bailie ? 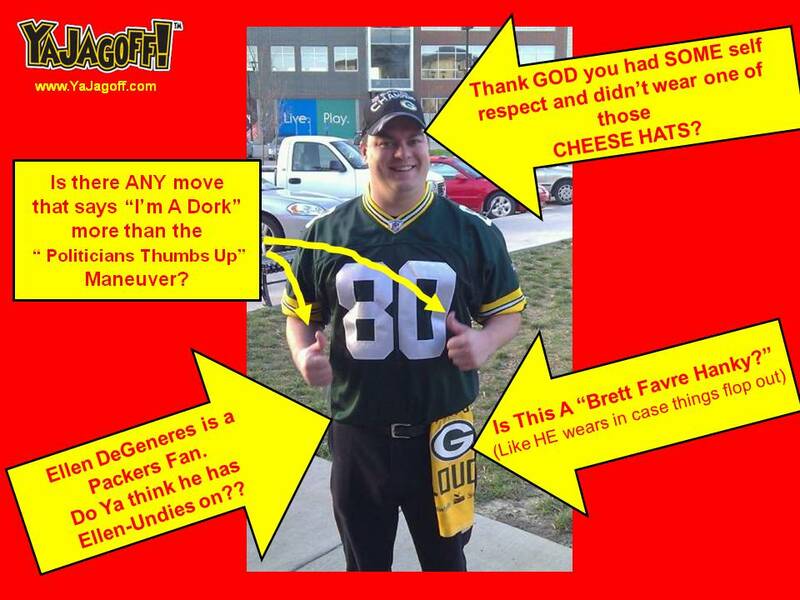 This guy, at a local company, dressed in his Packers stuff for the office Halloween Party. And there ya have it. Our very first Halloween Jagoff. In the meantime, we HAVE to pick on ya because your story is a helluva lot easier to pick on than those Jagoff parents that allowed their elementary school-aged kids to trick-or-treat, last night, dressed up as hookers, pimps and Jersey Shore characters. Ok, so you have HUGE cheese balls to come to work, in Pittsburgh, dressed like that. In the meantime, take your Brett-Favre-Texting-Aaron-Rogers-Is-Still-An-Altar-Boy-Lambeau-Ice-Box-Lambeau-Leaping self home (then Google Grendon Bailie!) Hopefully you did not win first prize and take a Lambeau Leap into your boss’s cubicle. One lesson we know you have NOW learned, is, be careful who takes your picture at work!! And by the way, NOBODY, with a normal testosterone level, TUCKS IN a football jersey, YA JAGOFF!!!!! Honorary Jagoff Catcher of Halloween!!! Halloween Note: Anyone remember those cheap plastic masks that could cut your eye out if they cracked? The eye holes on those things were NEVER big enough. I had to push the mask up against the bottom of my chin to line up the eye holes so I could navigate the neighborhood steps. And when I did that, all the mouth-spit and condensation, that built up on the inside of my mask, smeared all over my face. YEEECK!! Then, it never failed, halfway through trick-or-treating, the stupid elastic string would BREAK right at that little staple on the side. Previous articleTom Brady – Our EASIEST Post Ever! Steelers Win – Who’s The Jagoff?